The following recipe was prepared by my friend Karen for our Foodie Films event, where we watched Babette's Feast. 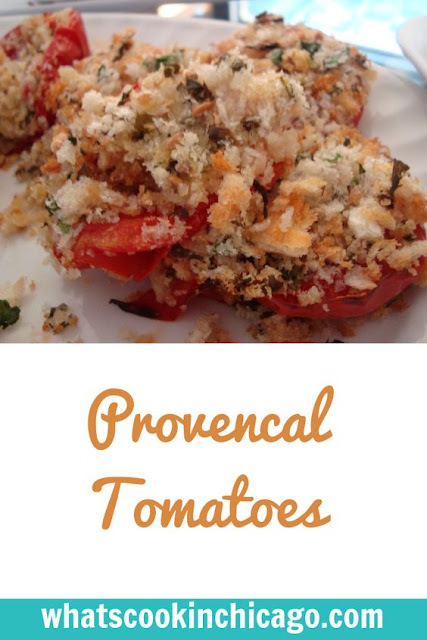 This dish makes for a great appetizer or side dish... and it's a delicious way to serve tomatoes! Cut the cores from the tomatoes, removing as little as possible. Cut them in half crosswise and, with your fingers, remove the seeds and juice. Place the tomato halves in a baking dish. In a bowl, combine the bread crumbs, scallions, basil, parsley, garlic, thyme, and 1 teaspoon salt. Sprinkle the tomato halves generously with salt and pepper. With your hands, fill the cavities and cover the tops of the tomatoes with the bread crumb mixture. Bake the tomatoes for 15 minutes, or until they're tender. Sprinkle with the cheese, drizzle with olive oil, and bake for 30 seconds more. Serve hot or at room temperature.